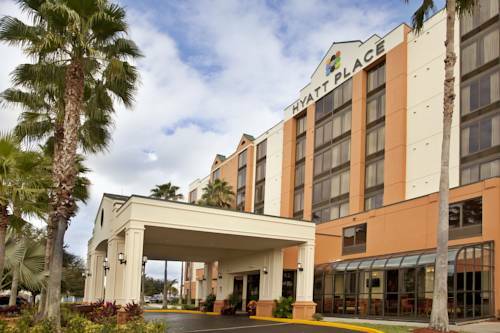 Located just 15-20 minutes away from Walt Disney World and Sea World, our contemporary-style hotel is the perfect getaway for business travelers and tourists alike. Relish the comforts of home with our plush pillow top mattresses and state-of-the-art media centers. Not to mention the separate living and sleeping areas make your guestroom the perfect place for both business and pleasure. Stay connected with the office with our complimentary high-speed Internet, or stay in and unwind for the night while browsing HD programming on our 42" flat-screen TVs. You'll even love onsite activities like our 24-hour fitness center and heated outdoor pool, the perfect additions to any trip to the city. Not to mention our complimentary breakfast and 24-hour Grab 'n Go case, featuring yummy treats like our signature flatbreads and fresh salads whenever you need them most. Guest must present valid credit card upon arrival. Pet Policy: For guest staying 1-6 nights, a $75 non-refundable pet fee will be administered. Guests staying 7-30 nights, a $75 non-refundable pet fee plus an additional $100 cleaning fee will be administered. Guests stay 30 + nights, please contact the hotel. The fee(s) will be inclusive of taxes. A maximum of 2 dogs per room are permitted weighing 50 lbs and under; two dogs may be allowed in a guestroom provided the combined weight of both dogs does not exceed 75 pounds; the pet fee encompasses this and pets exceeding are at the hotels discretion. All pets must be housebroken. There is a special event cancel policy in effect for April 13 - 14, 2017. All guest will be subjected to a full prepayment non refundable cancel policy. Conveniently located in the Central Orlando area, close to Universal Studios, The Holy Land Experience, Adventure Island, Walt Disney World Resort and the Orange County Convention Center and Orlando Expo Center. Easy access from I-4. Must guarantee reservation with credit card at time of booking. Guest must present valid credit card upon arrival. Exceptional cuisine by the world famous Emeril Lagasse. Elegant ambiance, outstanding service located in the heart of Universal's City Walk. An unforgettable experience. 4 different parks all located within a few miles of each other. Shopping, rides and shows. SeaWorld theme park. Shows, shopping and rides. Universal Studios, Islands of Adventure, City Walk. Theme parks for all ages.